Some things just need a little more time to cook before they’re well done, much like how Torchlight 2 is coming along. Runic Games has decided to officially delay the game’s release to properly balance and polish the final product. We finished our primary goals and moved back into polish," he explained, “There are two main parts to this - skills, and Acts. Skill polish involves making all the tier bonuses interesting, and finishing up the skills that we didn't show in the Beta, and just generally making sure that everything feels good and is reasonably balanced. A pass has already been done to give everything tier bonuses, but some of them are not as nice as we would like, so we are punching them up." Polish means taking that and making sure that the individual monsters are fun to fight, that their groupings work well together, that we expose balance issues late in the game ( be they from monster leveling, or skill leveling, or what have you ) and correct them. We want the individual monsters to each have a 'thing' that makes them unique, and interesting to fight in the context of other monsters around them. No word on the new release date was mentioned by Baldree. 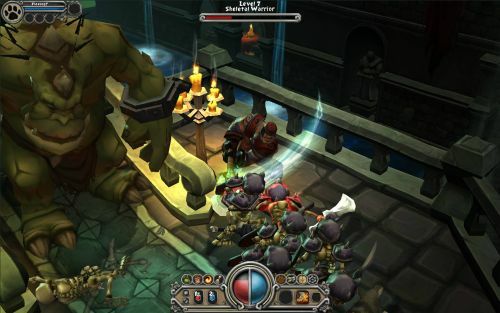 However, he is making sure to keep all Torchlight fans well informed with weekly updates on the game’s progress. Above all else, Baldree wants to “raise the bar with interiors” in Torchlight 2, more specifically being “densely detailed with decorations, have new effects, and lighting tricks that help push the mood and atmosphere.” For that, we thank you, Runic Games, for working hard on making a product worthy of our spending money. Page created in 0.2597 seconds.